Planning on inviting the horde over for summer-evening poker? 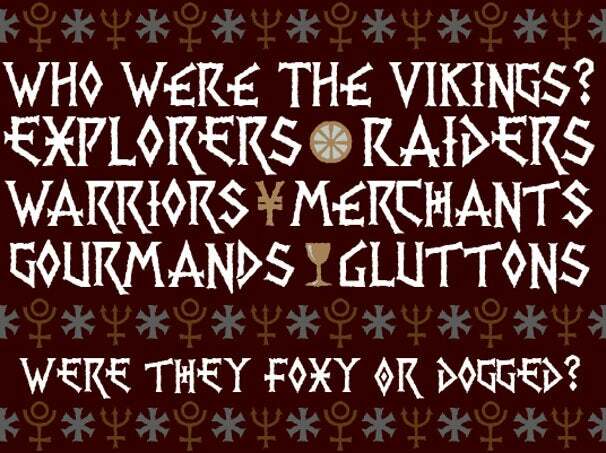 Type like a Viking (or at least like Canadian font designer Peter Rempel). Send a hearty “hail thee” with font PR Viking and its brother, symbol set PR Viking Alternatives (free). Rempel’s Nordic bad boys contain a crew of over 200 TrueType characters ready to ransack the first page they land on even as they cast a spell over it. The main set includes accents, diacritics, full punctuation, and all the numerals you need to total up and divide the pillage. Instead of a lowercase there are alternative capitals. For instance, type cap O for one version and lowercase o for its decorative second. A hint of pagan can be found in the accompanying symbol set. With PR Viking Alternatives, an industrious warrior can cast a heavenly horoscope or seduce the earthly elements, then switch to PR Viking and charge by the Yen, thanks to the full range of international monetary signs. Rempel learned his letterforms early on by poring over the Speedball Lettering textbook. A membership in the Calligrapher’s Guild of Manitoba followed, but the designer didn’t stop at twentieth century penmanship. He was on a crusade to bring the letterforms of the Middle Ages—alchemical symbols and all—into the computer age. The typeface has a ragged, hammered feel created by rasterizing the outlines. It's best used at 36 points and above to really appreciate the details. An undertaking this grand is bound to encounter problems. The main ampersand is an odd combination of two forms and the Os could stand to gain in girth to match the other characters. A lack of lowercase forms limits the download’s sensitive side. No whispering over ale in the Great Hall; it’s all shouting with this boisterous crew. Typographer Rempel is forever minding his Ps, Qs, and even Os, which is why he's updated the PR Vikings. The designer has replaced the font's question mark placeholder with a proper mark. He has also made the Os a little bigger which was a pet peeve of ours. A quick caution regarding PR Viking Alternatives: a handful of symbols occupy more than one position on the keyboard, causing minor frustration. However, the copyright sign appears only once in the main set and that’s how it should be—a subtle message not to go commercial with your PR Viking creations unless you have the designer’s permission.